For physicians and nurses in a wired hospital, the challenge has shifted from chasing down paper charts to obtain key clinical data to efficiently sifting through digital layers of applications, authentication, and tabs to access the information necessary for quality patient care. The task is complicated by the fact that clinical providers are not stationary. They may move from bed to bed, from ward to ward, from the emergency department to radiology, and from radiology to the ICU. Several studies have found that in busy hospitals, physicians and nurses log in and out of EMRs and other information systems as many as 70 to 100 times per shift. Although the log-in/log-out process is necessary for data security and HIPAA compliance purposes, it does not contribute to patient care in any other way. In fact, it is generally considered a waste of time. Plus, it decreases productivity by adding to provider fatigue and frustration, and albeit indirectly, consequently increases the risk of medical errors. Fortunately, the IT industry, which has long been engaged in the capture and storage of massive quantities of data, has developed the capability to help users find the specific information they seek when and where they need it. Context awareness uses location, user identity, and other environmental attributes to meet immediate information needs and provide customized, selected views of the appropriate data in both hospital and outpatient settings. One way to understand the benefits of this selected display of information is to compare it to a car’s computer dashboard. On passenger cars, the dashboard displays key information such as speed, the amount of gas in the tank, engine temperature, and charging voltage. However, racecars may have 20 different gauges to monitor variables such as brake pad thickness, tire wear, and lap time. In each case, the way the information is arrayed and presented is customized for relevance and utility as well as ease of use. Casual drivers do not care to be overwhelmed by data streams that are not immediately relevant to their vehicles and their use. Physicians are not much different except, of course, their focus is on patients and workflow, and the volume of data is much greater. It can be time consuming to access information systems and retrieve specific patient data, particularly in the modern hospital environment. Solutions offering context awareness may help. All things being equal, once physicians have experienced the benefits of context awareness and the customized computer desktop interface, they are reluctant to surrender them. New advances will make the process of replicating customized desktops across locations even faster and more efficient. Whether on the hospital floor, in specialized care units, or in an outpatient setting, efficient and stable workflow is one of the major components of clinician satisfaction and morale. EMRs are designed to archive information, but they are not always built with optimal workflow efficiency in mind. 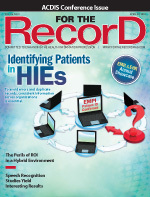 In particular, EMRs are not necessarily built to retrieve data for immediate use in a clinical setting. Context awareness software makes EMRs easier to use by identifying clinicians (identity awareness) and their whereabouts (location awareness), recognizing their clinical responsibilities (role awareness), and weaving these data elements into a customized information interface. It can provide each physician with filtered data based on specialty needs, if necessary. For example, a cardiologist is likely to want to review a patient’s latest electrocardiogram (EKG), while a dermatologist will have less of a need to do so. Context awareness software displays the EKG when a cardiologist—whose identity is recognized—opens the patient record but not when a dermatologist comes to round. Of course, there is nothing to prevent the dermatologist from retrieving the EKG if it is of interest and even to automate the process at his or her discretion. The technology’s attributes are not restricted to physicians. The screen can be customized for the benefit of nurses, physical therapists, and administrators—anyone authorized to access a patient’s notes. The location awareness feature facilitates the retrieval of patient-specific information. When a physician walks to room 212 to visit Mary Smith, he or she wants to access Mrs Smith’s records specifically. Should there be another Mary Smith in the hospital, it is critical not to confuse the person in room 212 with a Mary Smith in another room. Should Mrs Smith be moved to a different room, it is equally critical to make sure that the records opened at the bedside belong to room 212’s current occupant. Identity awareness can make the sign-on process more efficient. A wired hospital has hundreds of IT applications and dozens of data streams, including EHRs, PACS, lab systems, and computerized physician order entry. EMRs present additional templates and data fields from which to choose. The process of retrieving data begins with the clinician logging on. In some cases, multiple applications require multiple log-ons to satisfy security requirements. Only after the cascade of log-ons is complete can a clinician begin scrolling through data screens to retrieve specific patient information. Every time a clinician moves from one computer to another, a new sign-on is required. To comply with HIPAA security requirements, most systems are designed to require clinicians to sign out of one computer before signing on to the next. Each sign-on can take several minutes. From a workflow perspective, this process is intrusive and inefficient, resulting in reduced physician productivity. Such lengthy and complicated sign-on and sign-off procedures erect measurable barriers to efficiency. For example, at one Nebraska hospital, context awareness software saved nurses approximately 90 minutes of overtime per shift and reduced log-on times for physicians from minutes to seconds. The software has also helped significantly increase the adoption and usage of both new and upgraded EMR systems, while subsequently improving compliance with HIPAA and hospital security policies. Many hospitals seem to be burdened with antiquated approaches for gaining access to the EMR and the data stored within. Physicians and nurses stand by for minutes while waiting for the correct patient data to display. Context awareness solutions help address this problem by providing near-instant access to the correct data for the right clinician in any location. Broad best-of-breed information systems in healthcare were designed around or have emerged from combinations of applications, including EMRs, PACS, radiology information systems, document management systems, laboratory management systems, and digital pathology systems. By design, data were dispersed across multiple systems and could not be retrieved seamlessly or easily. The modular origins of best-of-breed information systems created difficulties in retrieving key patient data. These systems have not always combined easily. Interface inefficiencies intrude and interfere every time electronic data are accessed. As data streams in clinical medicine become more capable and more complex, this problem is likely to increase. Context sensitivity solutions help negotiate and mitigate these inefficiencies, improving workflow, restoring valuable time to clinicians, and shifting more focus to patient care. — T. Forcht Dagi, MD, MBA, FACS, FCCM, is a neurosurgeon, partner at HLM Venture Partners, and member of the board of directors of Denver-based Aventura.